My Lo-Hey Ceremonies in the Year of 2011! Chinese Lunar New Year has finally come to an end with happiness. This year, will be the most prosperous year for me as well as many who had tossing up the good to better luck with the SIN-MAL popular ritual, the symbolic Lo-Hey ceremony. Due to my current active social circles, many Lo-Hey sessions have been made at home and organized in and out of office, with colleagues, friends and family. I’ve taken the Lo-Hey for a total of 12 times out of 15 days of CNY as well as the pre & post CNY. Among the many different Yu Sheng dishes I have tasted this year, the best tasting one will be the Yu Sheng pack from Kwong Cheong Thye, and second best goes to New Moon brand Abalone Yu Sheng, for home dining purposes. As for restaurant Lo-Hey, I liked it from Peach Garden. 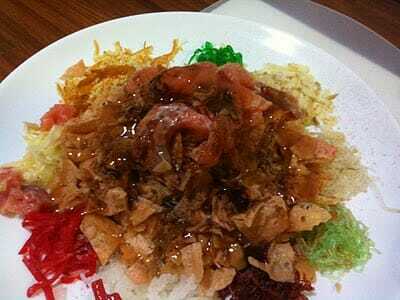 I loved eating Yu Sheng dish. I really did..
During CNY Eve reunion dinner. Lunch Lo-Hei at Sakae Sushi. Just two of us (My colleague and I), finished the whole dish of Yu Sheng! Floor team lunch at Beng Hiang Hokkien restaurant. Home-pack again. Just me, had the whole dish as my lunch at home! Buddies lunch Lo-Hey at Lao Beijing restaurant at Plaza Singapure outlet. Team lunch, again.. Treat by one of the colleague in my team. Last day of Lunar New Year. We had the team gathering Lo-Hey, again! To ‘well reserve‘ the prosperities of the whole year of 2011. Post CNY Lo-Hey! For tonight’s BIG MONEY striking! Huat ah (means Get Rich in Hokkien dialect)!